Buying numerous online coupon offers to make my food blog pursuits more economical has a down side – forgetting to use them before their expiration date. This has happened to me a few times now due to my forgetfulness or getting busy with the million and one things that life demands out of us, not to mention trying to get enough rest from being a hamster on the wheel. Fortunately, some of these coupon companies allow the full value on the offer way past the special cut-off date. Last weekend, after a Buddhist meeting, I remembered such coupon in my glove compartment to an Afghani restaurant close to the meeting point, and I plugged in the address. 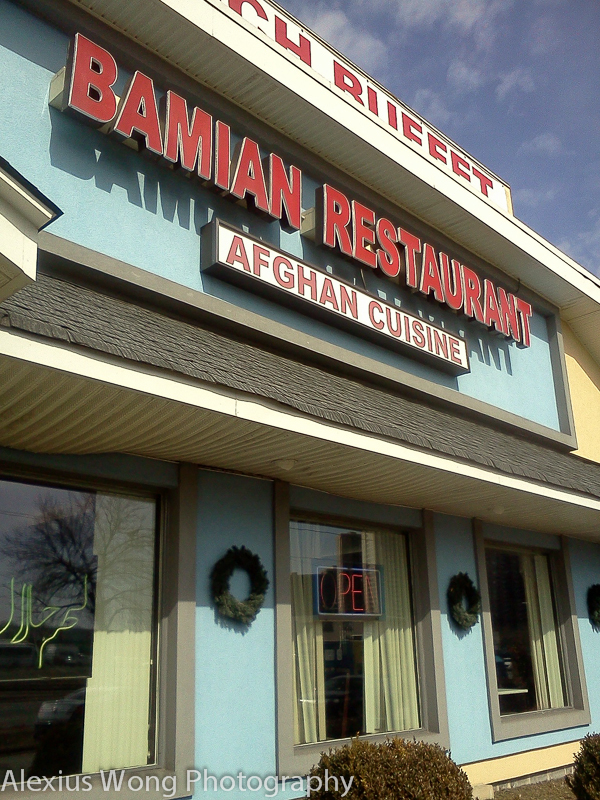 After the long-winded instructions (GPS always takes you on the most crowded roads), I arrived at Bamian Afghanistan Restaurant in Falls Church, VA, on the busy Route 7. Having patronized another restaurant of this Middle Eastern cuisine for many years, I was familiar with the cuisine, and I walked into the place with much anticipation. 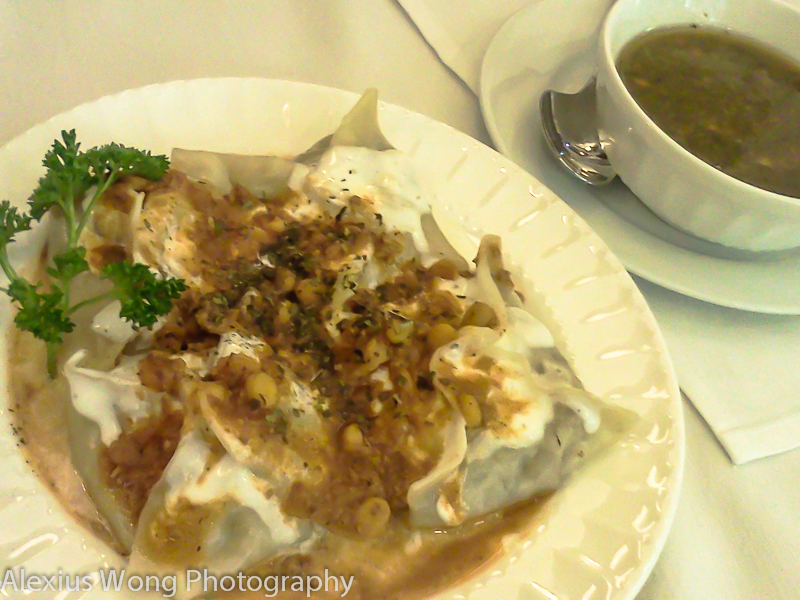 I opened my meal with a favorite Afghani appetizer – Mantu. A quartet of these dumplings arrived covered with a lentil sauce, slathered with some yogurt sauce and a sprinkling of dry mint. The dough skin was perfectly cooked, being not too thick or thin, strong enough to hold in a filling of ground beef and slivers of leek. The meat pieces were mild in flavor and pieces of leek soft but still with a slight bite, complemented by the lentil sauce that boosted the dumpling flavor especially with the occasional burst of coriander seed found in the top sauce. The yogurt sauce added a zing while the dried mint a clearing fresh flavor to all below it. The side of house hot sauce was very intriguing, and it tasted like a pureed form of spicy Italian Giardiniera pickles which I kept dipping my spoon into. I went through these pockets with no hesitation and with lots of gastronomic appreciation. Great start. For my main courses, I ordered a couple of my favorites. The first was the Vegetarian Platter. 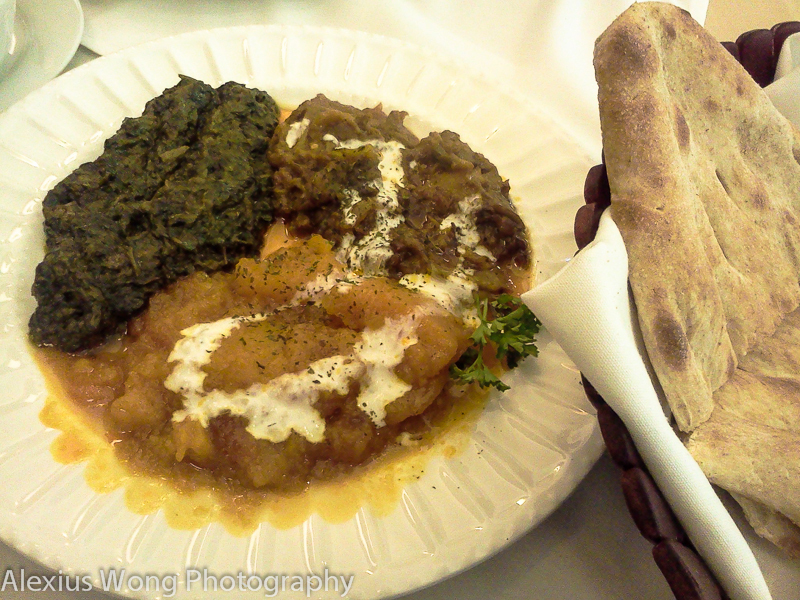 The plate arrived with pools of sautéed pumpkin (Kadu), stir-fried eggplant (Baunjan), and stir-fried spinach (Subzi). Each element on this plate was a different cast member (yeah, I’m watching the Oscars while I’m writing this). The pumpkin was naturally sweet and bright orange without any sugar or coloring enhancement, tasting slightly rich from a tinge of clarified butter. The eggplant was slightly sweet and tangy with hints of smoke wafting through this silky mixture. The spinach was a shade of dark green with a dose of bitter notes, some from the leaves, but mostly from a Middle Eastern herb that I have tasted in Lebanese dishes, compensated by a good deliberate and necessary hit of salt calculated by an expert hand. The basket of Nan bread had slices that were fresh, slightly yeasty and pillowy inside, making them the perfect vehicle to mop up all these vegetarian delights. 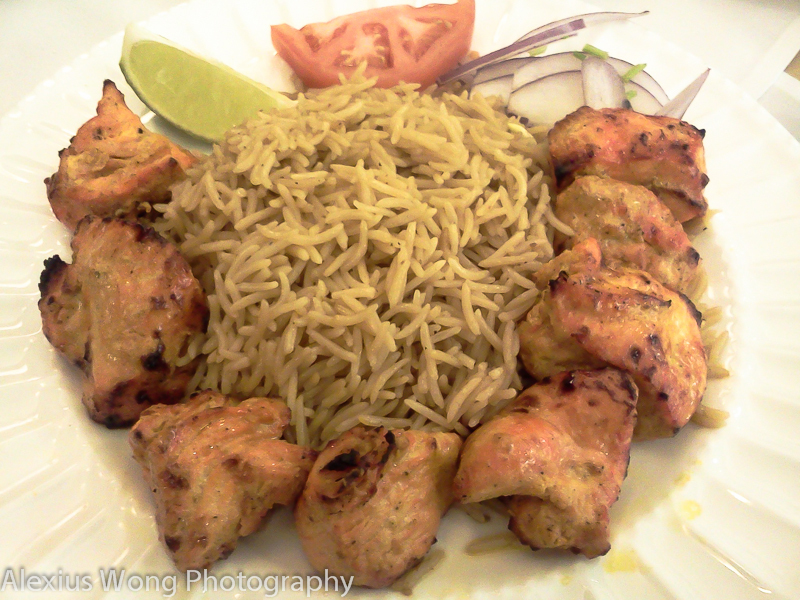 The second main course was Kabob Murgh – Chicken Breast Kabob. A mound of oiled Basmati rice was surrounded by a ring of chicken breast pieces. The beauty in the presentation was echoed by my reaction within the first bite. The pieces of poultry were perfectly executed both in the seasoning as well as in the marination of yogurt and spices, both subtle and present at the same time, hinting of cumin and other seed spices, producing moist morsels with a slightly charred exterior. The rice was a slight assault on the taste buds initially with a big hit of cardamon and cumin within the first mouthful. But once I got accustomed to the flavor, I started to appreciate the flavor along with the hay-like aroma of this mountain rice. Despite being oilier than what I was used to, there was barely a hint of oil on the plate, and each grain was perfectly cooked. I had not planned to write a blog on this establishment (excuse the smartphone photos). 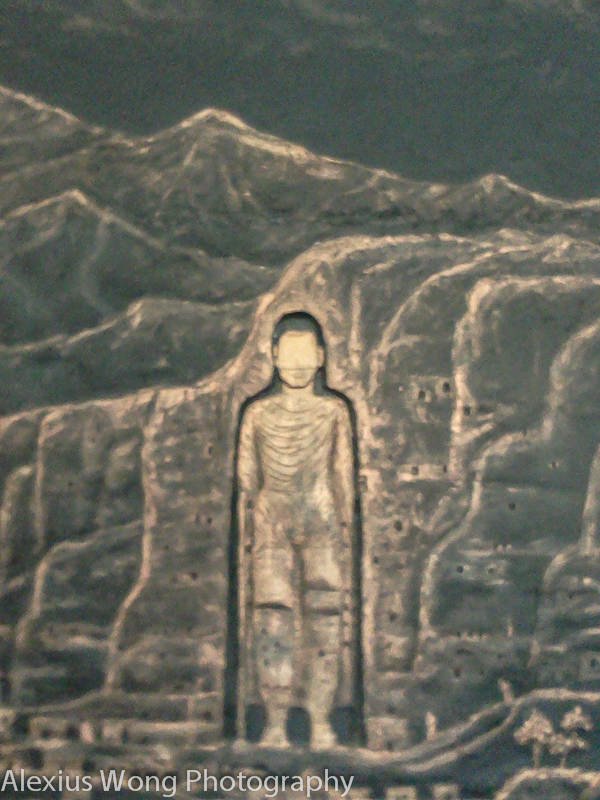 But after savoring their wonderful offerings, it would be remiss not to mention this hidden treasure. Starting from the delicately made yet flavor packed Mantu, to the Vegetarian Platter that would satisfy both the vegetarian eater and not-so, to the Chicken Kabob that was skilfully made with the flavorful and moist pieces of poultry accompanied by a side of spice-packed oiled rice. I had a clear view of the kitchen during the whole meal, and I was constantly eyeing the elderly cook plying his masterful trade. “Hand Flavor” is rarely found in many eating places, but the cook in this place does impart that extra je-ne-sais-qoui to these Afghan staples. If it weren’t for the long distance from my residence, I would be at this joint more often to enjoy the wonderful cooking. Yes, it is worth a revisit.